Fluorite samples usually show intense decrepitation. 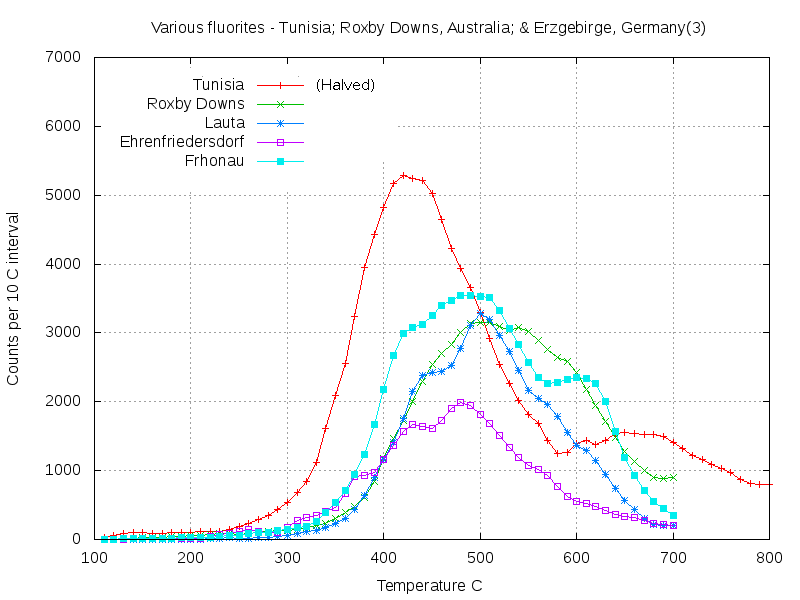 This graph compares selected fluorites from Tunisia, Australia and Germany. 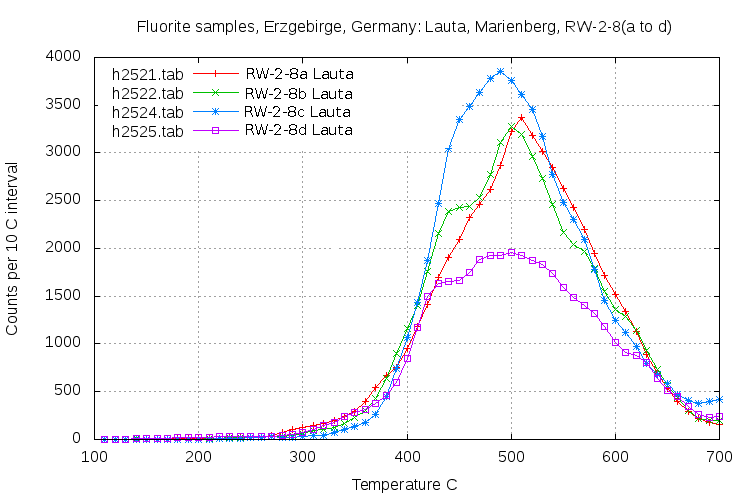 Note that the decrepitation of the sample from Tunisia was so intense that it has been halved on this plot for ease of comparison with the other fluorite samples. The Bou Jaber Pb-Zn-F-Ba occurrence in Tunisia is a lead-zinc deposit hosted in carbonates and formed at a low temperature. The fluid inclusions often contain hydrocarbons. The Roxby Downs Cu-U-Fe breccia formed at higher temperatures as a volcanic complex. The samples from the Erzgebirge in Germany are from greisen type deposits associated with tin mineralisation. Although the absolute temperatures of decrepitation seem to be much higher than the expected formation temperatures, the relative temperatures are as expected. At Lauta, the 4 samples are all very similar. There seems to be 3 separate populations of inclusions with significant variations in the contribution of the lower temperature (430 C) population to the overall result. 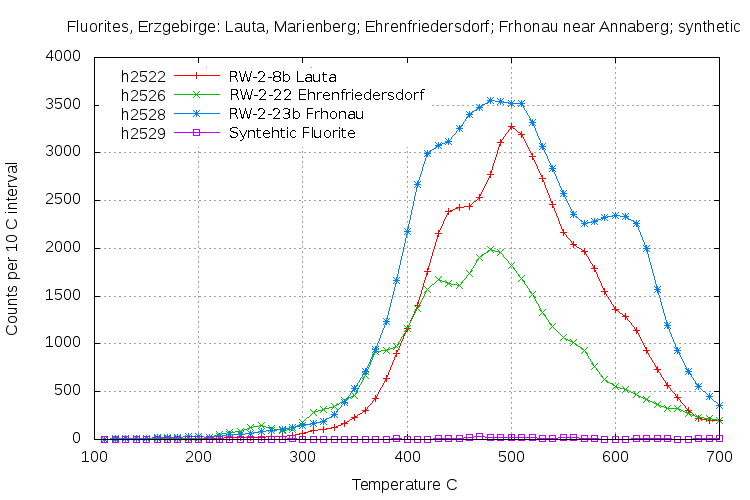 These samples from Ehrenfriedersdorf and Frhonau show more variation, with a prominent population at 610 C. The synthetic fluorite, which is manufactured to be inclusion free for optical use, has essentially no decrepitation as expected. This also confirms that decrepitation is not merely a function of the host mineral species but is indeed a function of the fluid inclusion populations present. 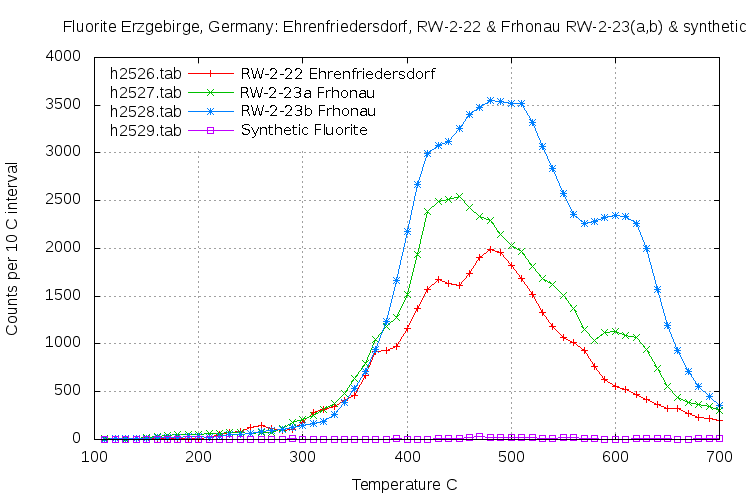 For comparison, one sample from each of the 3 Erzgebirge areas are shown here. There are significant variations within the region which are greater than variations at individual localities. These variations could be useful to categorise different fluorite occurrences.